For the past month or so, I’ve been experimenting with dinner rolls…as slider buns. And having found out that my very own local allergen-free bakery, Annie May’s Sweet Café, makes the best I’ve ever tasted…well…sliders have become one of my go-to menu items. And with summer on the way, despite not having a grill, it is burger time. BUT…being a gluten-free vegetarian sometimes means…I have to make my own sliders. And, trust me, some recipes work out better than others. For one thing, mine tend to not want to hold together, turning to mush and not really having that “meaty” texture to them. Granted, the two recipes I’ve done haven’t really lent themselves to being faux meat, but…the thought was there. When you bite into something that is meant to be a burger…that’s sort of the texture and taste that you are going for. The other day, after buying yet another bag of allergen-free dinner rolls from Annie May’s…and knowing I had plenty of fresh produce in my fridge…I thought…sliders for dinner on Sunday might be awesome. The thing was…I really didn’t want to make my own. It was a super-busy weekend as it was…and Sunday I had spent a majority of my day listening to the Dalai Lama speak in Louisville. I was starving when I got out of there (no gluten-free and vegetarian options at the venue) and after downing some ice cream…I went grocery shopping for…the Poblano Chick(pea) patties I blogged about not too long ago. Except…the store didn’t have them anymore. My plans were about to go down the tubes. But…then I remembered the glorious day I spotted SoL Cuisine Sliders (vegan and vegetarian, mind you) at Whole Foods in their freezer section. While it would mean I’d have yet another blog to write (I was backlogged enough I thought) on a product I could eat…I really wanted some real food for dinner that night. So…neglecting my initial response to make something I’ve already had before…my roommate and I headed over to Whole Foods and picked up a box of SoL Cuisine Original Sliders. It was like it was meant to be. Because this box contained six sliders…and I had six dinner rolls. Awesome! Granted, the serving size for this product is 2 patties…we really weren’t out that much more by adding one more for each of us for dinner. A serving (2 sliders…remember…) will set you back only 100 calories. Yep. 50 calories per slider. Not too shabby, right? I thought it was awesome. The normal serving size also provides a fantastic 13 grams of protein! These vegan and gluten-free burgers are are low in sodium (240 mg) and have 3 grams of fiber. I think I should also mention that two patties is only 3 grams of fat as well. How awesome are these little veggie burgers of gluten-free wonder?! And they weren’t difficult to prepare either. You can grill them, microwave them, cook them stove top, or put them in the oven. I had other things to prep with dinner…so I decided to do the oven method. 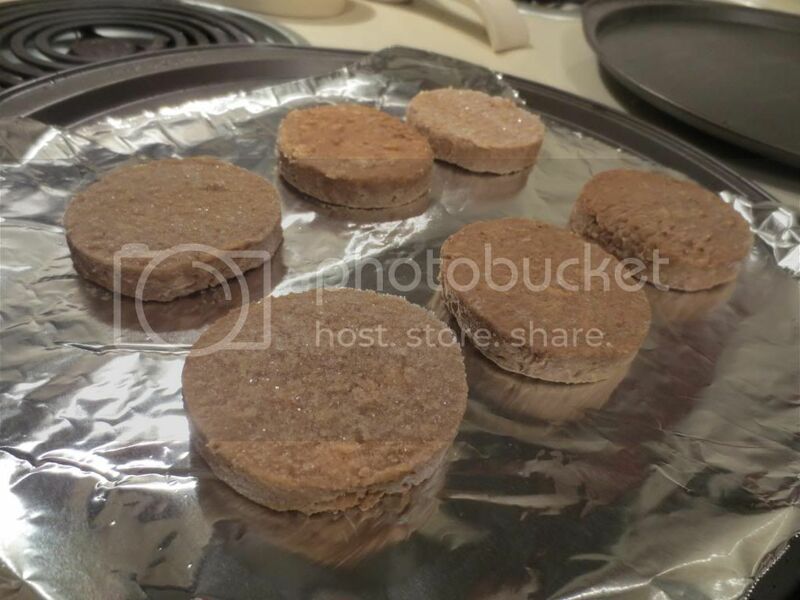 I hoped this wouldn’t backfire, as I’m sure grilling or even doing it stove top would have gotten a nice crisp on the outside of these little patties. That being said, I prepped a cooking sheet and laid out all six patties, putting them into a 350°F oven. They had to cook for about 10 minutes on one side…and then flip them over and cook for another 10 minutes on the other side. Perfect, as I would have to throw my dinner rolls in to toast them up for my condiments and add-ons. They smelled fantastic while they were cooking. And in that time I mashed up an avocado for the sliders, cut up some lettuce, chopped up a tomato, and sliced into an onion…all in the name of gluten-free vegan slider goodness. When the rolls and the sliders emerged, it was time to assemble the burgers. And I was starving and ready to eat. So easy. A touch of avocado, then lettuce, the slider, vegan cheese, tomato, onion, and then more avocado before placing the top of the dinner roll on and making…the perfect slider. I did this for all of the rolls and patties and served them up to my roommate and I for dinner. She was already digging in by the time I finished putting mine together…and she was raving about the flavor. This was good news, as the SoL Cuisine Tofu Rubs were just…meh…okay. I settled in for my own dinner and lifted a slider to taste. Oh…yeah…these are keepers. These are one of those products that will continue to find its way into my freezer. Seriously! The SoL Cuisine Original Sliders are amazing. They are perfection. They taste meaty without being made from meat. In fact…they have such great texture and taste, if you closed your eyes, you’d think you were truly eating a burger. It’s amazing. It’s awesome. I am in love with these. Not only do they have fantastic texture and flavor, but they pair so well with any topping you might want to put on there. I heaped these sliders full with different condiments and vegetables, and they didn’t detract at all from the taste of the burger. These definitely compliment anything you top it off with. Or…if you want to sneak a taste on its own (like I did…for the sake of the blog) know that they are also very delicious on their own. Three sliders were so filling. But I was happily stuffed. 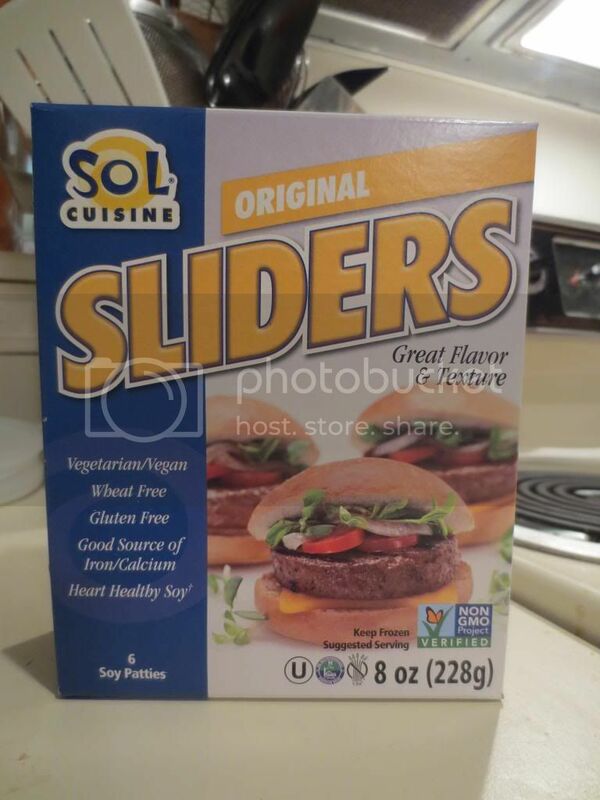 The SoL Cuisine Original Sliders are gluten-free and vegan. They are also kosher, and are a great source of calcium and iron. And what, exactly are they? Well, according to their ingredient listings, these little patties of meat-free, gluten-free goodness are composed of filtered water, soy protein concentrate, sunflower oil, dried onion, modified vegetable gum, dried tomato, sea salt, dried garlic, spices, organic lemon juice concentrate, and caramel color. I love seeing ingredients that I recognize. Love it. So, not only are these a healthy choice for a meal, but they are delicious as well. I can’t wait to purchase more of these, or even try the other two slider varieties in the freezer section: Spicy Black Bean Sliders and Quinoa Sliders. Both sound…awesome! They will both be purchased for the sake of the blog and consumed. I hope they can live up to the high bar the Original Slider set. Totally loving my gluten-free and vegan sliders. Thanks to SoL Cuisine…I don’t always have to make my own. Sometimes…I can just cook them up and leave the prep to someone else. 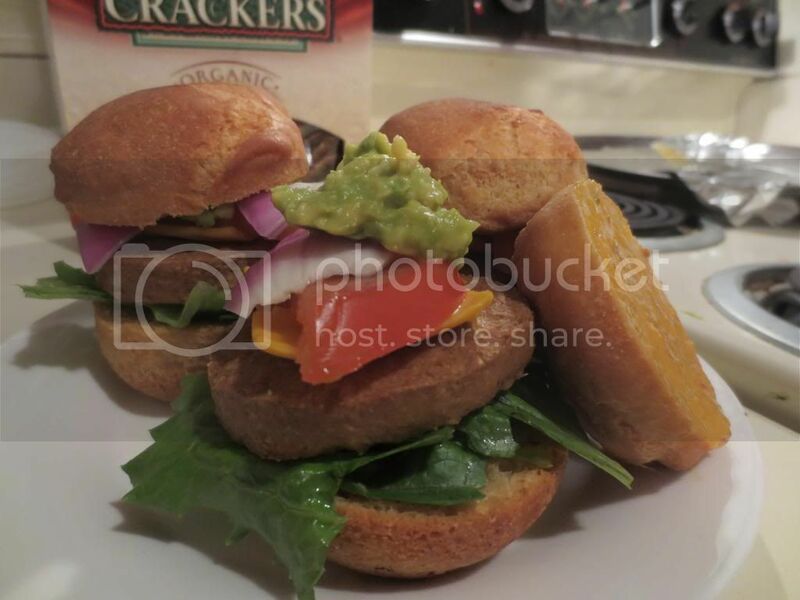 This entry was posted in Burger, Cheese, Entree, Food, Frozen, Gluten-Free, Products, Review, Sandwich, Vegan, Vegetables, Vegetarian, Veggie Burgers by The Celiathlete. Bookmark the permalink.